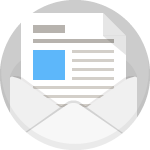 An update on current standardization initiatives. 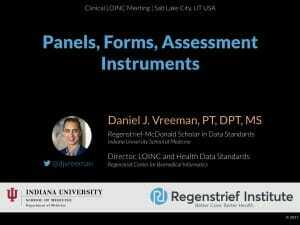 Presented by Daniel J. Vreeman, PT, DPT, MS to the Clinical Laboratory Improvement Advisory Committee (CLIAC) on 2018 04 11. An Introduction to LOINC: The universal standard for identifying health measurements, observations, and documents (Brief Version). Presented by Daniel J. Vreeman, PT, DPT, MS to the NIEHS Linking Complex Disease and Exposure Data to Established Data Standards study team on 2018 03 01. Data standards to enable recruitment and outcomes research. 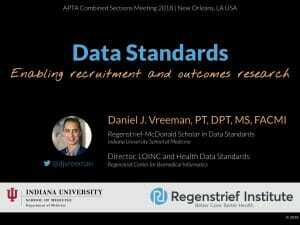 Presentation by Daniel J. Vreeman, PT, DPT, MS, FACMI at APTA Combined Sections Meeting 2018 in New Orleans, LA. 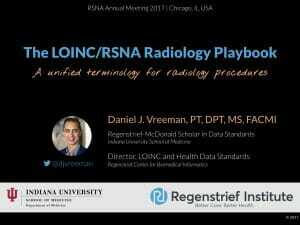 The LOINC/RSNA Radiology Playbook: A unified terminology for radiology procedures. Presented by Daniel J. Vreeman, PT, DPT, MS at the RSNA 2017 Scientific Assembly and Annual Meeting on 2017 11 28. FHIR and LOINC: they go together like chips and salsa. Presented by Daniel J. Vreeman, PT, DPT, MS at the FHIR DevDays conference on 2017 11 15. The LOINC/RSNA Radiology Playbook: A unified terminology for radiology procedures. Presented by Daniel J. Vreeman, PT, DPT, MS at the AMIA 2017 Annual Symposium on 2017 11 08. Social and Behavioral Determinants of Health: Fundamental informatics challenges for enriching Health IT systems, including an overview of the national picture and role of vocabulary standards. 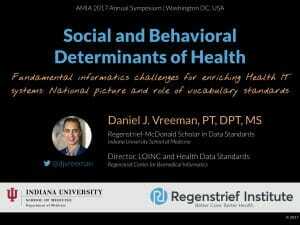 Presented by Daniel J. Vreeman, PT, DPT, MS at the AMIA 2017 Annual Symposium on 2017 11 07. An Introduction to LOINC: the global vocabulary for tests, measurements, and observations in healthcare (MedInfo Version). 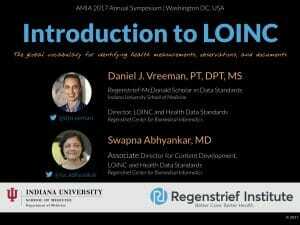 Presented by Daniel J. Vreeman, PT, DPT, MS and Swapna Abhyankar, MD at the AMIA 2017 Annual Symposium on 2017 11 05. An Introduction to LOINC codes for radiology procedures. 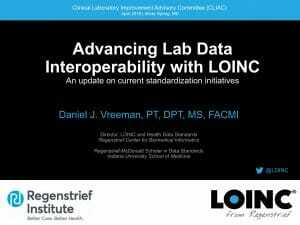 Presented by Daniel J. Vreeman, PT, DPT, MS at the Clinical LOINC Tutorial on 2017 09 27.